I don’t normally read thrillers. I don’t really like the genre, but I did read this book, largely on the basis of a brief review in The Age. I still don’t like thrillers. The book is set in Israel, which is what attracted me. Dahlia Barr (even the name annoys me) is a successful Israeli human rights lawyer, the daughter of an even more strident peace activist mother. She is approached by the Israeli government to become a Special Advisor for Extraordinary Measures, overseeing the application of torture during interrogation. Rather implausibly, the government figures that if a human rights lawyer gives the go-ahead, then it must be alright. Even more implausibly, she accepts the job, thinking that she could make a difference. This resolution is soon put to the test when her own son, an IDF soldier, is kidnapped by Hezbollah, along with a Bedouin Arab who as a citizen of Israel, also serves in the IDF. In a scenario that has become all too familiar in recent weeks, the two boys are tortured and video-taped to pressure the Israeli government into swapping the boys for the recently-arrested Edward Al-Masri, a Canadian professor returning to Israel. He was apprehended at customs with a large wad of money, and is the first ‘enhanced interrogation’ case that Dahlia is called upon to oversee. Her amazement on finding that he is, in fact, a childhood friend turns to resentment and flintiness when she learns that he may have information about the whereabouts of her abducted son. Like many thrillers, this book is structured with a series of short chapters- in some cases, only a paragraph in length, each on a separate page. The action swings cinematically from scene to scene. There’s a heavy reliance on conversation for characterization, supplemented in Dahlia’s case by a rather clumsy italicized internal dialogue. Details in the plot are quite technical in places for verisimilitude, which means that they need to be explained in layman’s terms later. No, I really don’t like thrillers much. 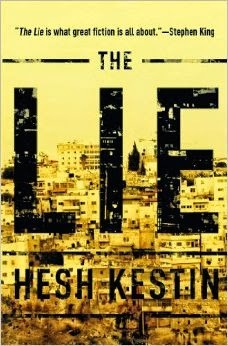 What I did like was the complication of Israeli identity and the setting. There is a twist at the end, which does give the book more depth, although even I guessed it before it was revealed (which, believe me, is a worry). I don’t often review books that I’ve read from genres that I generally avoid, because (as you can see) most of my responses are to the genre, rather than the book itself. If, however, you do like thrillers, here’s a shout-out to a thriller set in Melbourne –Fire Damage– written by my friend Richard, available on Kindle.